We depart for the South Coast tour early in the morning and stop by two waterfalls. 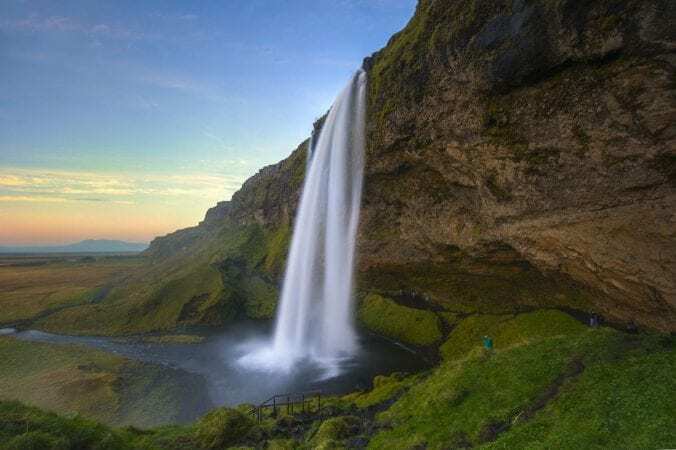 The first stop is by a waterfall called “Seljalandsfoss” where in good conditions, people can walk in to a cave behind the waterfall. The other is the mighty “Skógafoss” believed by many to be one of Iceland’s most beautiful waterfalls. We also view the small peninsula, Cape “Dyrhólaey”, where you might spot some puffins, and take a short walk at the beautiful black sand beach of “Reynisfjara” with its columnar basalt formation, ocean caves and seaside cliffs. By the glacier “Sólheimajökull”, we take an easy walk up to the edge of the glacier, when conditions allow. Lunch stop on the way (lunch not included in the price).